Well, I thought if I posted cards that were "spring like" that the weather would start to warm up - that's so not the case. We've gotten snow everyday since Sunday, with another 2-4 inches being called for today. The boys will be thrilled, as they've got a four day weekend coming up! Since the posting of flowers didn't warm things up - how about some Chocolate Covered Strawberries! I created today's card using CPS155 and PDCC17. Inspired by fellow KSSDT member Lynn's Chocolate Covered Stawberries, I set out to create my own. I used Kitchen Sink Stamps Multi Step Berries - stamping as follows: #3 Ridhing Hood Red, #2 Riding Hood Red stamp off, #1 Riding Hood Red stamp off, #4 Riding Hood Red. 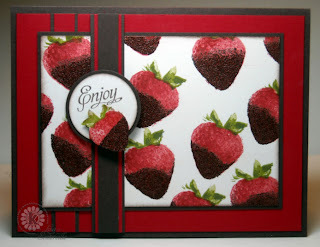 To create the Chocoalte, I partially inked #1 in Versamark, stamped over my strawberries, then added Dark Brown Embossing Powder that was mixed with some Strawberry Kool-aid and heated with my Heat Gun, it sure smelled good while I was creating! Don't forget to check out today's Kitchen Sink Stamps Blue Plate Special, there's lots of great sets specially priced - today only! Save 10% at Kitchen Sink Stamps, click here then enter LISA10KSS at checkout. LOVE the card; what a great idea! But I thought you'd want to know, that your links don't work. Oh my gosh, what a brilliant idea!!! I LOVE IT! Can I case this idea sometime? Yummy!!! looks like you can just start eating them! What a unique and creative way to use the colors for this week's Play Date Cafe challenge....so glad you played along with us! A new challenge will be posted at midnight TONIGHT! Yummo, I love this card Lisa. Just received those stamps in the mail today too. Beautiful, I can almost eat them they look so real, but my scrath and sniff did not work!! MMMMM....This card is SOOO yummy. Looks good enough to eat!